[SatNews] Antwerp Space has been awarded a contract for approximately 9 million euros by Airbus Defence & Space, Bremen, for the development of a new-generation, EGSE (Electrical Ground Support Equipment) to support the European Service Module (ESM) of the Orion Multi-Purpose Crew Vehicle (MPCV). Airbus Defence & Space selected Antwerp Space to design, industrialize and manufacture the complete EGSE consisting of a series of power-related Special Check-Out Equipment (SCOE), based on the reference system developed by Airbus Defence & Space. Orion is a spacecraft developed by NASA for future manned missions to destinations beyond LEO, such as a lunar orbit, near-Earth objects and Mars. The EGSE comprises a service module—the ESM—that will provide essential support functions to the crew module and its four astronauts. These include propulsion and attitude control, power generation and control, thermal control, as well as consumable resources (water, oxygen and nitrogen). Airbus Defence & Space, Bremen, Germany. Antwerp Space will supply the system in a total of four different configurations which are to be used for assembly, integration and verification (AIV) purposes in various industrial facilities across Europe (e.g., in Bremen, Germany and Les Mureaux, France) and in the U.S. states of Ohio, Colorado, Florida and New Mexico. 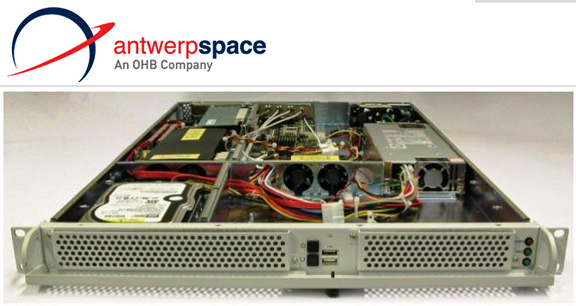 Antwerp space has already delivered one configuration consisting of a number of core unit testers for use in Europe. The ESM is being funded by the European Space Agency and developed under the responsibility of Airbus DS GmbH in Bremen. It represents the in-kind contribution made by Europe to cover its share of utilization of the International Space Station. 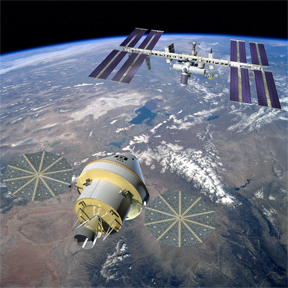 Artistic rendition of the Orion spacecraft approaching the ISS. Oliver Juckenhoefel, in charge of MPCV-ESM at Airbus Defence & Space, said, "Antwerp Space has, for many years, been an established leader in the assembly of the EGSE used by spacecraft integrators for on-ground verification of their hardware before the actual launch. We are confident that using the latest technological evolution by Antwerp Space will guarantee smooth and efficient testing and delivery of the ESM by Airbus Defence & Space to ESA and NASA." Oliver Salisch, Managing Director of Antwerp Space, said, "The award of this contract is the recognition of Antwerp Space's expertise in the development and integration of complex ground tests systems."